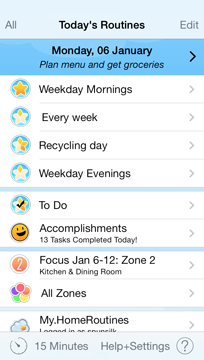 Home Routines is an app for what we like to call Repeaty Stuff. You create lists of jobs that need to be done around the same time, or on the same day. These lists are called Routines. 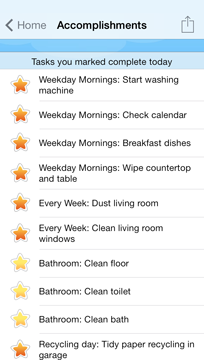 These appear to remind you when you need them, and when you mark each task as complete you get a gold star. On each screen of the app you’ll find a small timer. Merlin Mann talks about using a timer to “Run a dash”, and The FlyLady says “You can do anything for 15 minutes.” 9/10 productivity experts* recommend setting a timer to help you get started and get focused! There’s also a little simple To Do list, included to help you focus on what you’re actually working on; if you think of something you “just need to do”, tap it in and finish what you’re working on. It’ll keep. The Accomplishments list is my favourite part of the app. It’s a happy little place where you can see (and share) everything you’ve marked as complete today. There’s free syncing between devices with our my.homeroutines server, so you can keep more than one device in sync, or share your lists with another human being so you can work together. It’s a glorious app that makes you feel good about all the things you need to do, and shows you how much you’ve got done even on days when you don’t feel like you have. And stared and glared at the messy floor. On stage, my toys came alive and made everything neat as a pin. Unfortunately, such magic happens rarely in the real world. Neither did I spontaneously develop a keen desire to CLEAN ALL THE THINGS on becoming an adult. Just as Wayne Campbell wryly referred to his extensive collection of name-tags and hairnets I, in turn, have made dozens of household notebooks, printed cleaning lists, control journals, laminated pages and online checklists. As an over-researcher (it’s a valid form of procrastination!) I read and re-read the collected knowledge of all the housework experts, and edited and re-edited my lists. It sort of helped, but then it didn’t. The temptation was too strong to tweak them a bit more before I started on cleaning the shower. Yes, I’m a “perfectionist” but I’m also super anxious and easily distracted. Squirrel! In 2009 my handsome husband Tim brought home a new iPhone and I pounced upon it. The device was clearly burdened with glorious purpose. I stood upon the mountaintop and cried: I AM GOING TO MAKE A CLEANING APP THAT ROCKS. And we did. And Home Routines was its name.